Geometry of sun and shade. 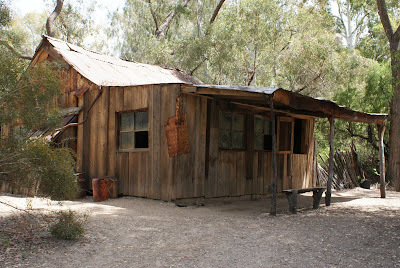 Would you call this a small business? A friend pointed out this tiny little office so I drove by to take a look. That building is very narrow as you can see when compared to that parked car. What an unusual and tiny building. It makes me wonder what it looks like inside. I pass this house almost every day on my way to work and I always admire the tile work on this house that has turned into an office. It’s not as impressive as the wonderful Portuguese tile that JM shows us from time to time on Oeiras and Environs Daily Photo, but it does dress up this building quite a bit. Last Friday evening I was on my way to meet some friends for dinner and while at this traffic light, I noticed how the office buildings on Central Avenue were framed by stormy clouds moving in from the east while at the same time, the setting sun behind me was lighting up the glass on those same buildings. It was such a perfect moment and I knew it wouldn’t last very long. I shot this with my little point and shoot looking straight out the windshield. It’s a little fuzzy but I like it. 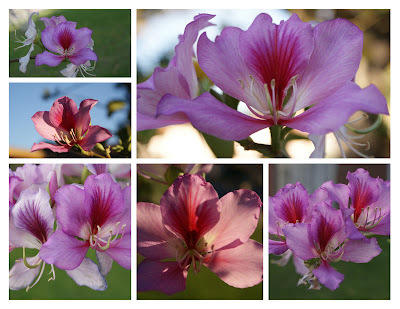 It is the time of year when orchid trees bloom and since I have one in my front yard, I have a fantastic view. 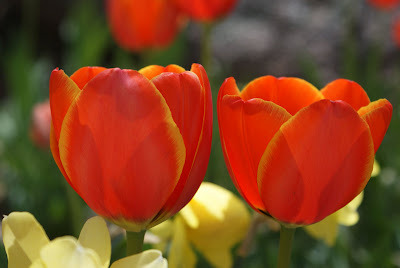 The flowers are so beautiful and they only last a few weeks so I thought I’d show you a few of the flowers I’ve been admiring. My tree is quite small compared to some I’ve seen around town. I always feel a little sad when the blooms are all gone. My little tree seems to pour all of its energy into producing these blooms and after they are gone it seems to take the tree a little while to recover. 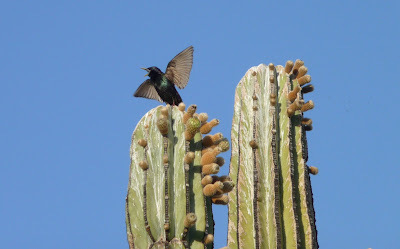 This bird was a bit of a show off! This was one of those moments when I stopped in my tracks, ripped the point and shoot camera out of my handbag and hoped for the best. It’s not the best exposure, but you get the picture. Last summer I mentioned the five C’s that fuel Arizona’s economy, Copper, Cotton, Cattle, Citrus, and Climate. 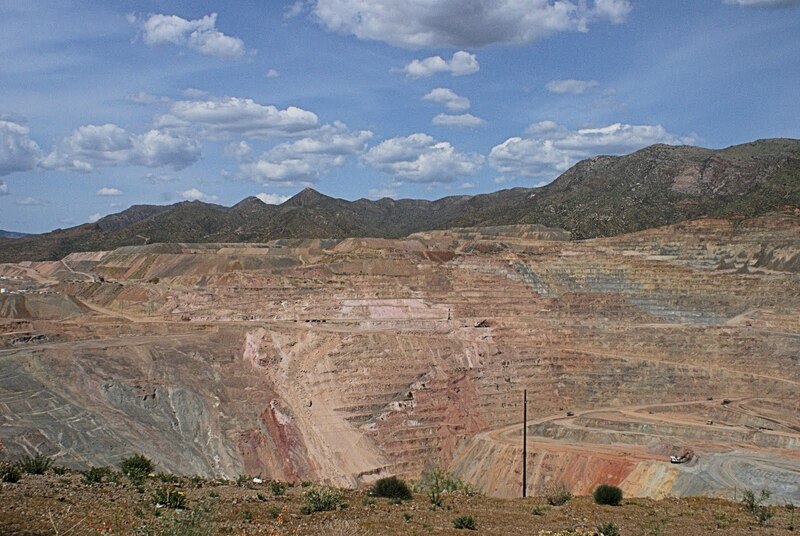 Today I show you an open pit copper mine located in the high desert east of Phoenix. This mine is commonly called the Ray Mine and it is currently operated by ASARCO (American Smelting and Refining Company). I took these pictures standing at a view point and looking into the pit. I could see and hear the equipment working below. 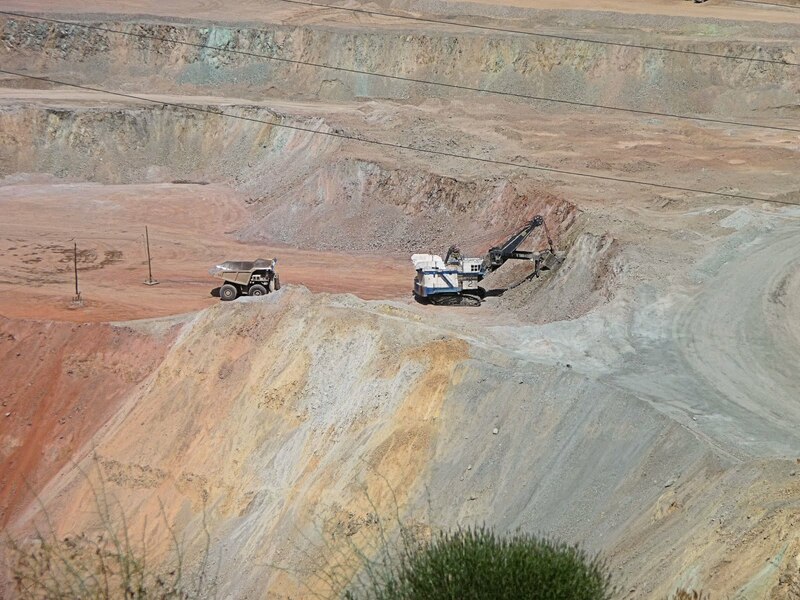 From where I stood, they looked like Tonka toys way down there. 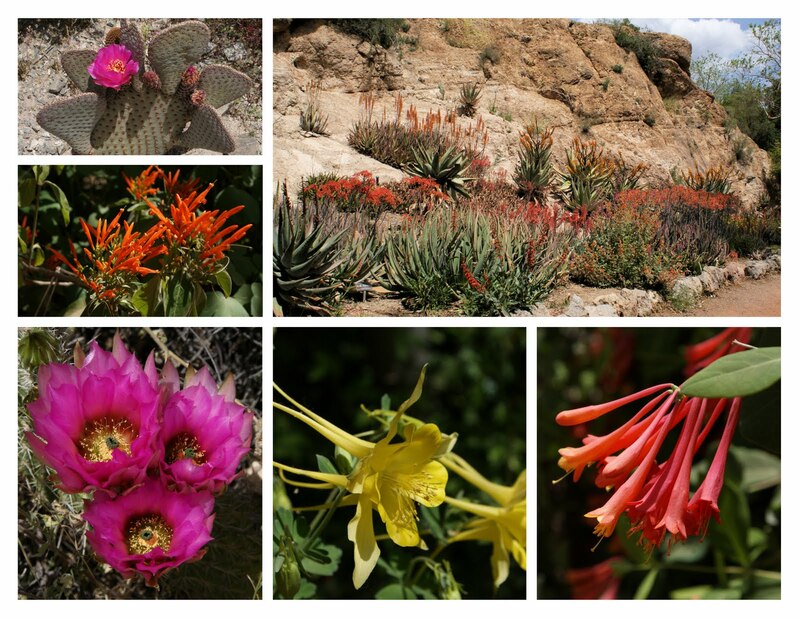 Here is a collage of some of the beautiful flowers blooming in the desert. 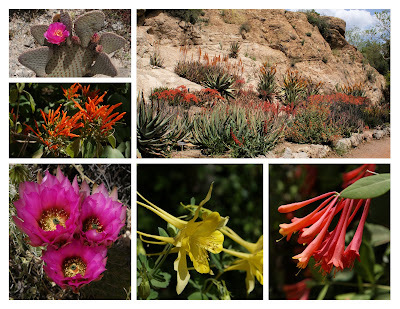 These are all from the Boyce Thompson Arboretum. One of the trails at the Boyce Thompson Arboretum is identified as an outback walkabout. This structure is on the trail and the faint sound of the didgeridoo can be heard coming from it. A little bit of Aboriginal art can be found along the trail. On Saturday when I as at the Boyce Thompson Arboretum, I encountered this hummingbird along one of the trails. I didn’t think there was any chance of catching him with the camera so I must admit I was surprised when I downloaded photos. Not bad for a chance encounter. 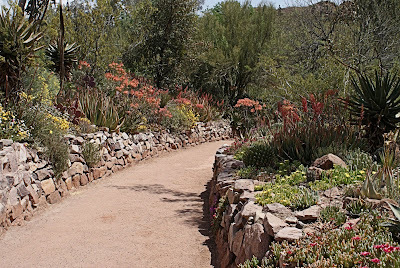 Yesterday I drove 70 miles (112 K) east of Phoenix to visit a state park called The Boyce Thompson Arboretum. 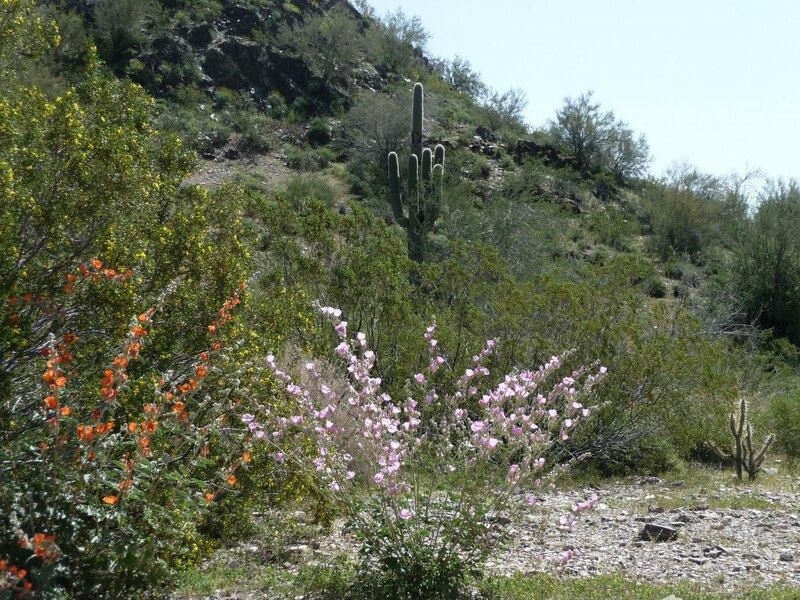 There are many hiking trails there and an incredible collection of plants and wildlife. I hadn’t been there for many years and it has grown in the years I was away. 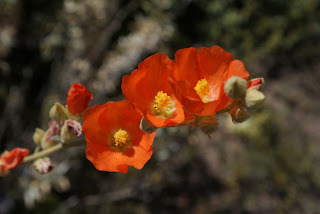 With the desert in bloom, it was a good opportunity to see more wildflowers and cactus blossoms. The top photo is of the main trail head. 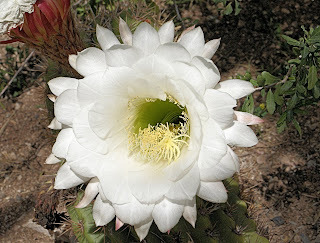 The small photo is of one of the hundreds of cactus blossoms begging to be photographed. 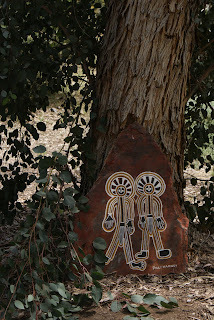 This is a public art piece that lines the sidewalk near the entrance to the Phoenix Art Museum. The museum underwent extensive remodeling and enlarging in 2006 and this art work by Jun Kaneko was part of a program called “Percent for Arts”. This program is a legislation that uses a percentage (anywhere from .5% to 2%) of a publicly funded capital improvement project for the commissioning of public artworks that usually reside in, on or near the project being constructed. The artist was born in Japan in 1942 and now resides in Nebraska. He named this piece “Colour Box”. At least that's what I've been told! ……or should I say Tulips? My friend Janet took me with her to the last season home game of the Phoenix Suns vs. the Denver Nuggets. I was fascinated by the tattoos on Nugget's player Chris Andersen. He has some strange looking tattoos covering both arms, his chest and on his lower legs. But, that isn't how he got the nickname "Birdman". Apparently he has a habit flapping his hands like bird wings whenever he makes a particularly aggressive play. I didn't see any flapping last night because the Phoenix Suns soundly beat the Nuggets 123 to 101. The Suns were ahead by 18 points within the first 5 minutes of the game and never looked back. A good night for the Phoenix fans! I was up the mountain again this last weekend at my friend’s cabin. He hosted a little dinner party for friends and arrving guests were greeted by a huge bouquet of wildflowers harvested from the desert and a bottle of chilled champagne. Terrific host, don’t you think? I think this camper has converted to solar power! Baseball season is in full swing and if you want to watch the Arizona Diamondback’s play, you will want to visit Chase Field in downtown Phoenix. When this arena was built, it was affectionately called BOB because its official name at that time was Bank One Ball Park. But, Chase Bank bought Bank One and now we have Chase Field. This field even has a VIP box that contains a swimming pool. Imagine that, baseball and swimming all thrown together. 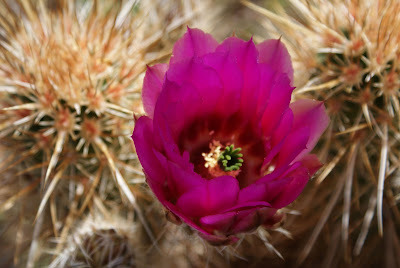 While walking around in the desert and enjoying the many varieties of wildflowers, I came across this cactus bloom soaking up the sunshine. I love finding these beauties blooming in the wild. 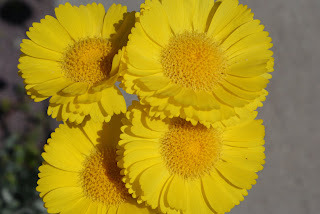 The small photo is a group of bright yellow wildflowers that were growing right at the very edge of the road. 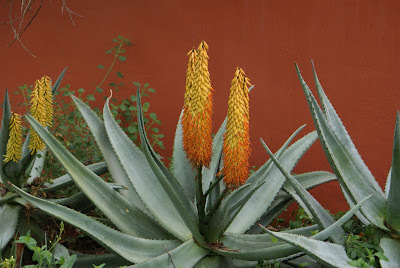 I have no idea what they are called but they are certainly intricately composed beauties. 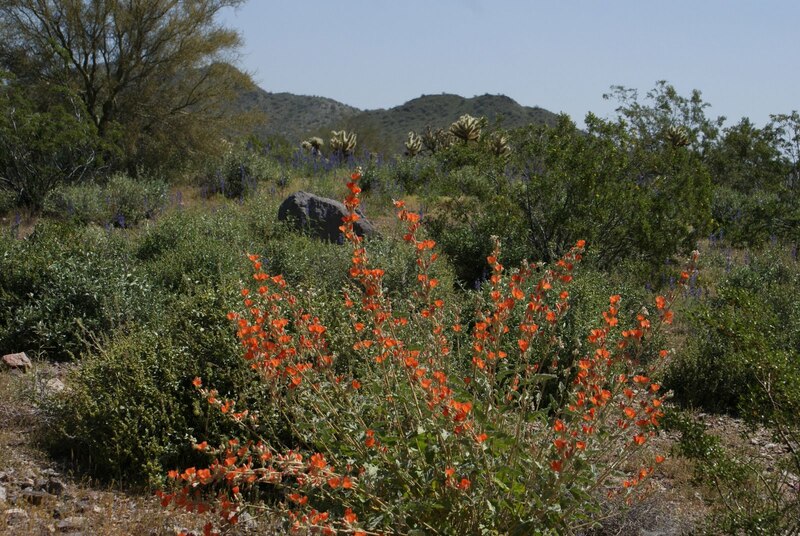 Another cluster of wildflowers blends some pink flowers with the orange ones that are backed by some tiny yellow flowers blooming on that shrub in the back. That beautifully shaped saguaro signals that you are in the desert southwest. 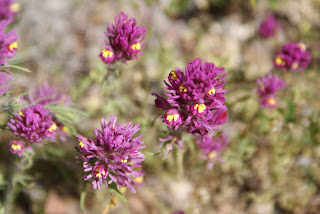 The smaller photo shows a close up of the purple flowers that were carpeting the desert floor in another location. These bright orange flowers dotted the desert landscape and if you look closely can see the purple hue of the desert lupine climbing up toward the cactus at the top of the rise. Enlarge to photo to get a better look. The small photo is a close up of those orange blooms. 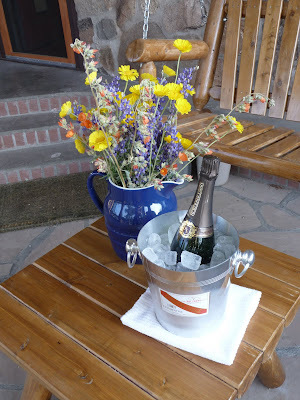 I mentioned yesterday that I spent the weekend with a close friend at his cabin northwest of Phoenix. To get there one has to drive through about 70 miles of desert before climbing the mountain to the high desert location. The drive can be a bit boring during the hot summer months, but on this trip it was so beautiful that I found myself stopping along the way to take some photos. 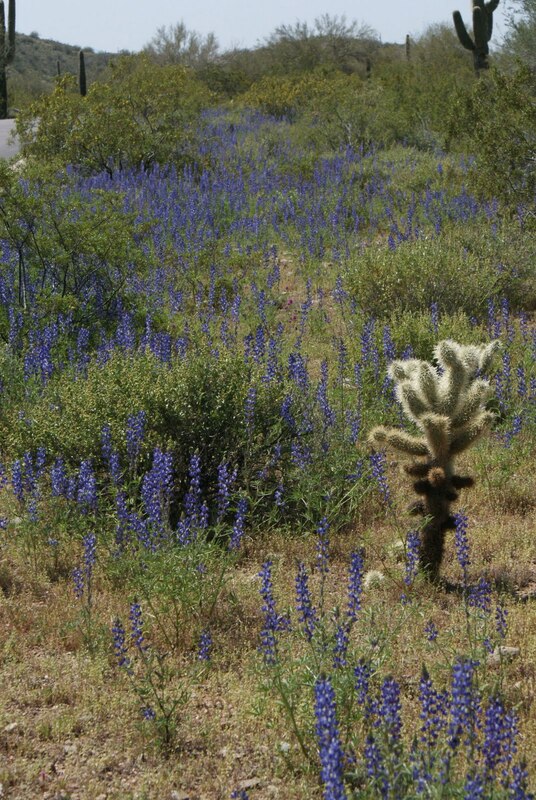 Those rainy days we had have worked their magic on the desert landscape. I pulled over to the side of the road for today’s photo so I could share with you the abundance of wildflowers lining the highway. 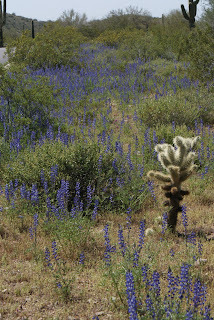 In the smaller photo you can see the spread of desert lupine growing very near the road creating a purplish glow that draws the eye in that direction. 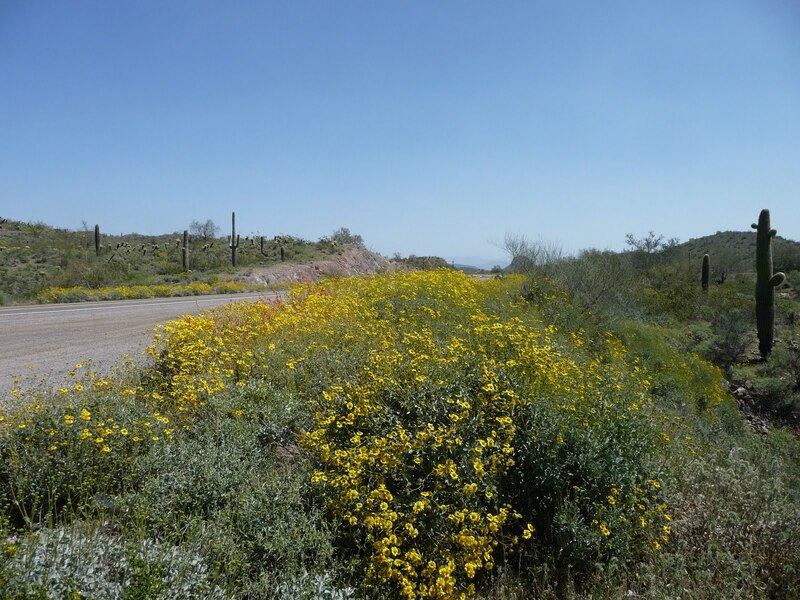 Tomorrow I’ll show you some of the things I saw by pulling on to a side road to get a better look at what nature has provided. Over the last weekend, I visited a close friend at his cabin in the mountains about 70 miles northwest of Phoenix. 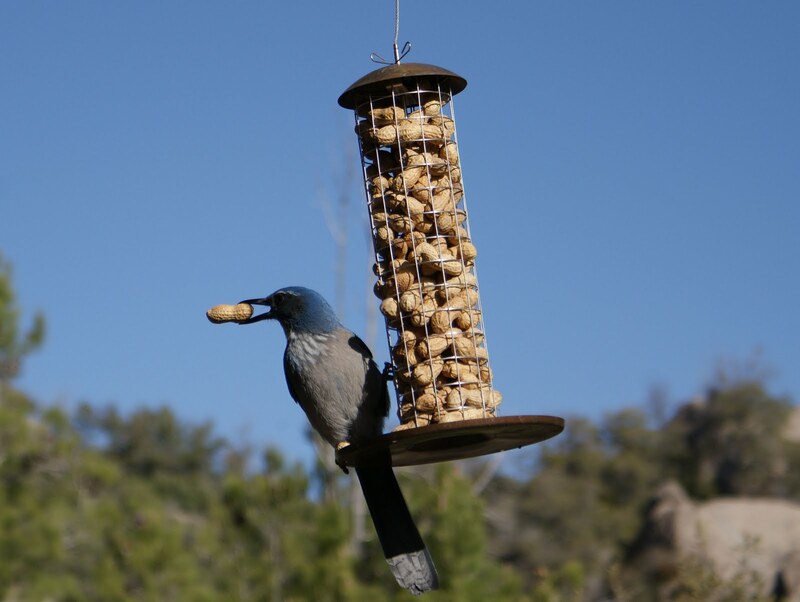 He has quite a collection of birds that visit his yard and chow down on the food that he leaves for them. The favorite meal of the blue jays are peanuts and they squawk loudly when he fill the feeder. 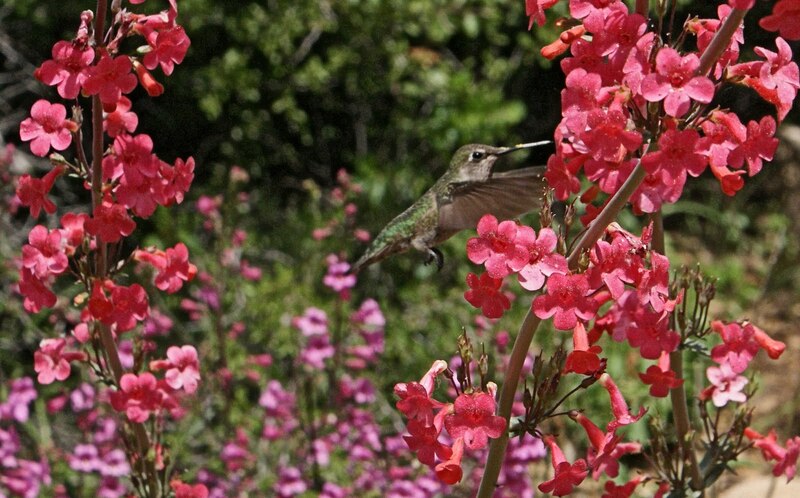 I’ve watched them on many occasions, but this was the first time I got a really good shot of them raiding the feeder. It appears that my neighbor a few doors down from me found a sly way to entice the Easter Bunny to visit their house. That explains why there were no chocolate eggs at my door! I spotted the Easter Bunny hiding among some floral arrangements! Have a wonderful holiday everyone. 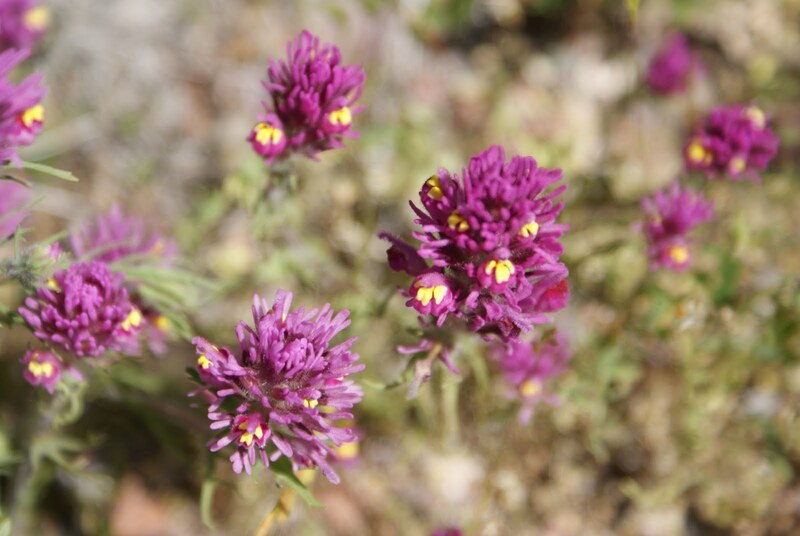 Everywhere in the desert, things are starting to bloom. These agave blooms seem to blend very well with the color of the wall behind them. This was my back-up red photo. 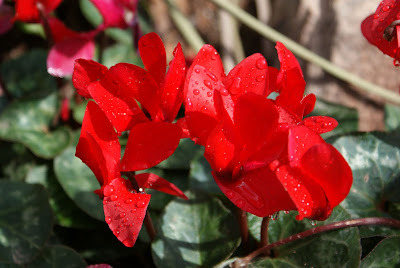 You can’t go wrong with bright red flowers. I may have mentioned before that I have special love of shoes. Well, okay….it’s more like an obsession. Whatever! I spent a lot of time trying to think of something unique for the red theme day without much luck. Then I thought of my collection of red shoes. So, here you have it, an assortment of red shoes straight out of my closet.